Organic. Wine of Italy.Nestled high in the western Sicilian hills, San Mario painstakingly tends its beautiful organic vineyard. 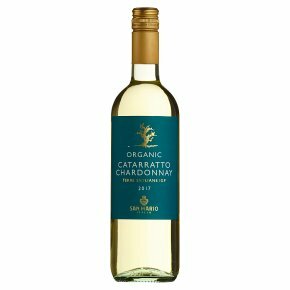 A perfect combination of warm sunshine, cooling sea breezes and cool evenings produce the perfectly ripe grapes from which this crisp, aromatic catarratto chardonnay is made. Delicious on its own or even better over looking a beach with a plate of sweet, red Sicilian prawns.